Watch as stores compete to offer you the best price. It's fast and furious! The store checks out the device and sends your cash. You don't have to lift a finger! Get an instant quote, sell your old iPhone for cash risk-free! Where can I sell my iPhone near me? How much is my iPhone worth for trade-in? When is the best time to sell an iPhone? What model is my iPhone? Since the first iPhone launched in 2007, Apple has been pushing out brand new models every year making fans want the latest technology. Lately, these advanced smartphones have gotten EXPENSIVE, which means when you're looking at how much can you sell your iPhone for there's a high chance you'll lose more trade-in cash by picking the wrong buyback store. So where is the best place to sell your iPhone? The options are carrier trade in services, shopping mall kiosks with ATMs or online trade-in stores. The best place to resell your device is online, in fact, if you look at the comparison charts below you can see you'll only get a fraction of your devices worth using resale ATMs or a carrier trade-in service. Use our valuation tool to save time and avoid going down a rabbit hole of quote hunting, we compare the highest prices and give you the best deal online. Instant quote: Find your iPhone, select the carrier, condition and storage size. Choose buyback store: Pick the store that fits your needs, price, payment options, reviews, shipping options. Send it FREE: Using the pre-paid shipping kit they provide you, simply drop in the mail. Most carrier buyback deals seem like the convenient option, however, the majority of the time you'll be receiving a fraction of your iPhone's resale value, and it will be via account credit instead of cash. This trade-in offer credit is either deposited to your carrier account instantly or applied over the life of your contract. The exception is if carriers run promo codes seasonally or with major phone releases, sometimes during that period the credit can be a reasonable amount. If you're thinking of using your carrier out of trust, most trade-in services are run by a third party company they outsource it too. 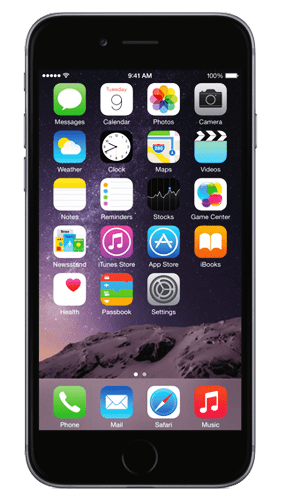 With BankMyCell you compare iPhone buyback programs that will not only pay more, but they'll also give you the freedom of getting paid in cash to spend on whatever you want. If you were upgrading, our price locks and higher payouts you get more cash to use with your carrier with 30 days to take care of it all, simple! If you're looking where to sell my iPhone for cash in person, make sure it's ONLY because you need cash that day. Check out the table below to see how these convenience trade-ins profit on offering much less than your iPhone's actually worth. So if you're looking to sell your iPhone for cash near you, consider that with BankMyCell's trade-in programs, it doesn't matter where you live, the FREE shipping kit is sent directly to your home. In other words, if getting more money is important to you, it's best to compare iPhone trade-in program prices here than visiting a store to get a lower deal. After all, going out to the store takes the same amount of time as mailing an iPhone to a trade-in program. 3rd March 2019: Where can I sell my phone near me? Thinking of selling and wondering what's your used iPhone worth? You should always keep in mind that your used device's value will always vary from the amount of wear and damage it has, its storage size capacity and what carrier it's on. The highest trade-in payouts are received by people that have iPhone's in immaculate condition with no technical faults. Typically the larger storage sizes and carrier unlocked devices get the highest trade-in values. For example, say you're curious how much is an iPhone worth when it's got a cracked screen or has water damage, perhaps it's locked to Verizon, AT&T, T-Mobile or Sprint, or maybe it's brand new! The easiest thing to do it use BankMyCell to find your device, and quickly pick the options on each device's quote page to find out how much your old iPhone's worth today. With BankMyCell's iPhone trade-in service, you get what your phones actually worth. Furthermore, you'll get it in cash to spend on what you want, no low ball offer store credit here my friends! When you send your device, all our stores securely remove any data and destroy your sim cards. This means your data is protected. Our service is 100% free, and from when you get your instant trade-in quote to when you send your pre-paid shipping kit, you are under no obligation. Freeze your quote for 30 days and ship it if you want. Essentially, the best time to sell your iPhone is now. Why? 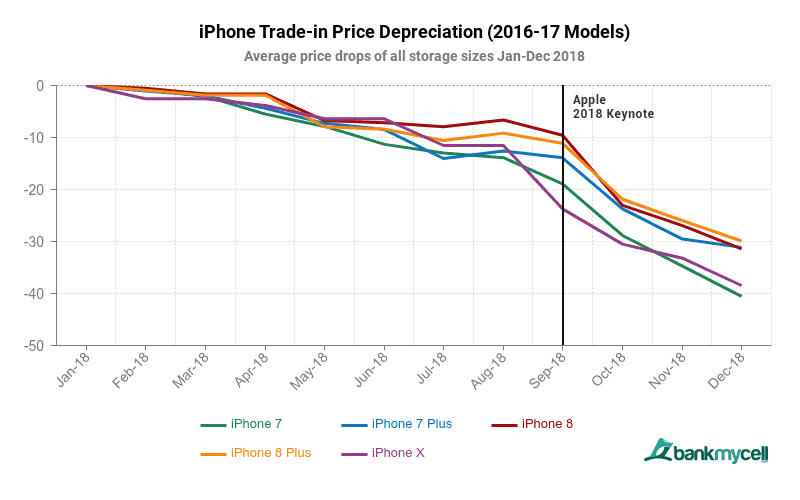 Prices rarely go up and last for more than a day or two, they steadily lose trade-in value for 11 months of the year then plummet when the latest model gets released. So if you're upgrading to the latest model you need to lock in your trade-in a day or two before the announcement. For example, on average last year's iPhone will lose 38.46% in the first 14 months, with 26.92% of that in the 2-3 months following a new iPhone release. If you used the price lock and sold a few days before last year's iPhone was announced, then you'll make around $150 more. Lock in your quote for 30 days by getting a quote and requesting a pre-paid shipping kit; this gives you plenty of time to get the new device and sell. Phone name: Settings > General > About > Tap Model to show the code starting with 'A' and check against the table below. Storage size: Settings > General > About > Size is under Capacity. Network Carrier: Settings > General > About > Carrier will be under Network. Other options are checking the original packaging if you still have it, or plugging in a cable and connecting to iTunes. Alternatively, check Apple's guide. How to sell your iPhone? Select your iPhone from the model list at the top of the page to get an instant price. The top offer box will give you the best place to sell your iPhone for the most cash and our service is totally FREE. Now all you need to do is select your buyback program and fill in the form to get the sale kit sent to you. Most stores offer pre-paid shipping packaging that they send; others let you print the free shipping label out if you want to get paid quicker! Regardless of the trade-in option you choose, the whole sell iPhone process is so easy, and you get to ship it for FREE. Once the store you chose gets your phone, they some checks on them to make sure everything is in order and you get your direct deposit or PayPal the same day. If there is a problem with the quote, you can get the phone sent back, so there's never any commitment. How long will payment take after I ship my phone? People are selling broken iPhones and asking for full price. People are sending the wrong devices in. The iPhone they're trading in has water damage. If any problems come up you will be contacted via email with a new quote; you can choose to accept this or get your phone sent back to you. In most cases, the store will even cover this shipping cost even though you made a mistake! No risk and no cost! No stores accept devices that fail IMEI referencing checks (blacklisted devices / stolen etc). Stolen phones will not be returned to you unless you're the rightful owner. How do I turn off Find My iPhone, iCloud and reset my iPhone? On Apple devices running iOS 7.0 or higher, you'll need to deactivate to security lock to iCloud and Find My iPhone. To find your iOS version go to Settings > General > About > Version or just assume that if you have an iPhone newer than an iPhone 5 you need to do this. Make sure you backup your iPhone to iCloud or iTunes, then in just a few taps of your screen you'll be done! Learn how to reset iPhone to sell in this video here, removing all your data, Find My iPhone and iCloud activation lock in seconds. Yes, you will learn how to wipe the iPhone before trading it in! You will need to do this regardless of where you sell as your iPhone is locked to iCloud with Find My iPhone. However, any devices sent to trade-in stores are completely reset, and SIM cards get destroyed, most forensically wipe all personal data. In fact, so it's one of the safest ways to trade-in and sell your iPhone for cash out of all the options available. What to do before you sell your iPhone? 1. Unpair your Apple watch: Only if you have one of course! 2. Backup your old iPhone's data: This way, if you're upgrading, you can transfer it onto your new device. If you already have a new device and have it up to date, forget about it of course! 3. Wipe your iPhone before sale: delete all the data before you sell using our how to wipe the iPhone guide. 4. Remove your SIM & accessories: If your phone has a case, it will be recycled for no cost so you might want to leave it on to protect it during shipping. If you want to keep that or any other accessory remove them, SIM cards also get destroyed, so it's up to you if you remove it or not. How quick is the whole trade-in process? Usually 2-7 days. As soon as you find an offer on our site and use the no obligation checkout, you'll get a trade-in confirmation email from the trade-in store you selected and us. They'll either send you a free shipping kit to your address or email you a printable label (whichever you choose). So at this stage, it depends on you sending the device, if you got a printable label and shipped your device the day you sell it you could get paid in 48hrs. Of course, if you're in no hurry to trade-in your iPhone and selected to receive a shipping kit by mail, it can be as fast as 4-7 days to get and ship it back with the iPhone inside. Do I need to include chargers, cables, and accessories? If you no longer need your accessories, then you can ship them in too, and they'll get recycled responsibly. Almost all stores won't offer you any additional money for supplying accessories, so it depends if you want to declutter your home or not. It's worth noting that if these items are binned they go into landfills and damage the environment, these buyback programs will be much more eco-friendly. How do I pack and ship my device? FREE Shipping Kit: If you selected to get a prepaid shipping kit sent to you, then simply follow the instructions the iPhone trade-in store provides, it will be very easy! FREE Shipping Labels: If you selected this option, you'd be emailed a label to print out and stick onto your own packaging. Make sure the box or package you send it well sealed and padded out with anything you can get your hands on, postal services can be a little rough!